In order to keep this list down to only 10 species without being a litany of the world's rarest herps, I've included only animals that I have a reasonable chance of actual seeing in the wild. 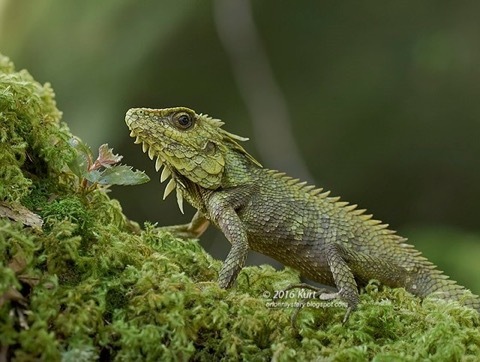 So, no Chinese Giant Salamanders (highly unlikely that I will ever visit their habitat), Tuatara (highly unlikely that I'll be back to New Zealand), Earless Monitor Lizards (likelihood of finding one even in ideal habitat is nearly zero), etc. With their well-known hood display, cobras are obviously very cool, and the King Cobra also holds the title of world's largest venomous snake. I would be happy to see any random little pawn or rook cobra, but I'd be happiest to see the King. Illustration by Sir Joseph Fayrer in the public domain. 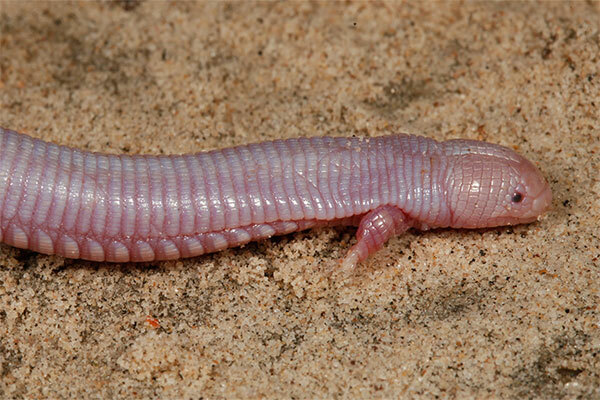 I simply need to see me one of these bizarre little pink earthwormy lizardy things. You wouldn't believe the folklore that has built up around these weird but harmless little creatures, and wildherps.com being a family-friendly website, you won't hear it here. Photo by Matt Cage, used by permission. 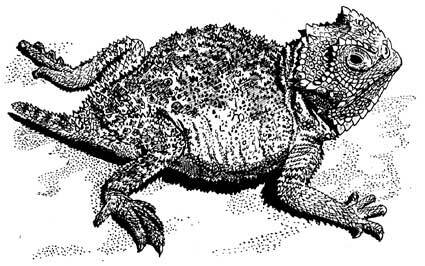 Phrynosoma ditmarsi makes the list partly because no self-respecting list of desirable herps should be without a horned lizard, and partly for its rediscovery story. It was originally described based on three specimens in the 1890s, then not seen again for more than 60 years. People began to wonder whether those three specimens were really just weird-looking examples of the relatively common Phrynosoma hernandesi, until experts examined the stomach contents of the three museum specimens and correctly guessed where to look for this Mexican species. Illustration by Russian artist Rostislav Dans. I have now seen several of the crazy-looking arboreal lizards of Malaysia, but this one has got to be the very craziest-looking. Also, they are known from only one small area, and have been seen by very few people. I hope to find one on a future trip to Borneo. Photo by Kurt “Orion” G, used by permission. Madagascar's snakes do not generally reach the weird-looking extremes of its lizards and frogs, but this snake is certainly an exception. Each gender has a long nasal protrusion, but they are very different shapes. And I have to have an excuse to go back to Madagascar. Photo by Neil Kelley under Creative Commons license. 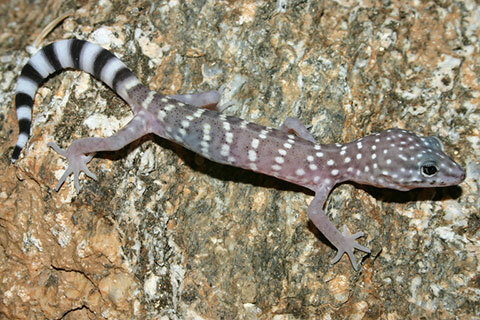 Most of these pretty geckos live in Baja California, but their range extends northward into a small stretch of my home state California. I've been in that area searching for reptiles many times, and searching in particular for this species many nights, but have yet to come across this elusive little lizard. Maybe this year! Photo by Will Flaxington under Creative Commons license. 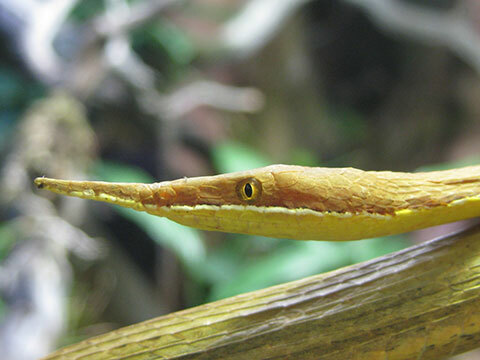 In two trips to the Amazon rainforest in Peru, I've seen two of these snakes, which as everyone knows grow to be huge, can easily eat and then regurgitate Jon Voight, etc. But both of them were captured by local people and brought to our camp, and that doesn't meet my criteria of seeing them in the wild. 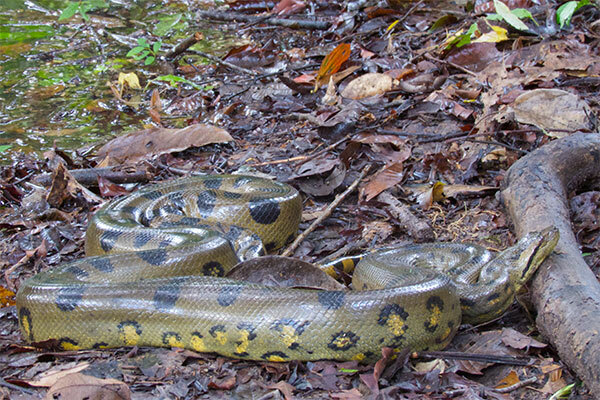 Photo by me of Green Anaconda recently captured by local villager. 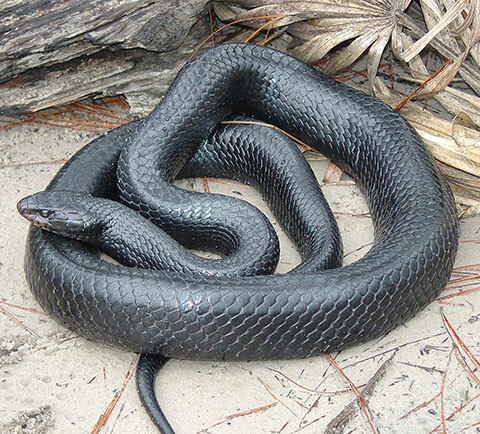 This is a beautiful, glossy, iridescent blue-black snake that is generally considered the USA's largest native snake, with a maximum length of around eight feet. Its favorite habitat is also coveted by people, and as usual the people win, so its populations seem to have declined drastically throughout much of its former range. It currently occurs throughout much of Florida and part of Georgia, with some reintroduced populations and possibly some relict populations in nearby states. Photo from Wikimedia.org in the public domain. 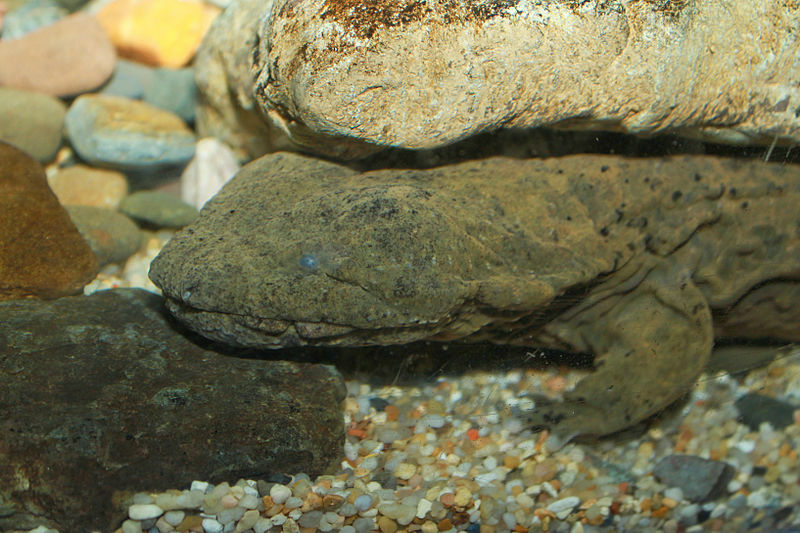 Though it is extremely unlikely that I will ever see a wild Chinese Giant Salamander or Japanese Giant Salamander, the USA has its own species of (not-quite-so) giant salamander. And it has a great name. Photo by Brian Gratwicke under Creative Commons license. 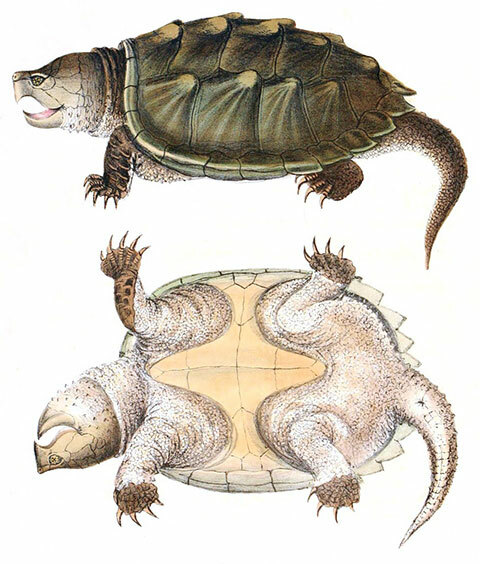 This is the USA's largest freshwater turtle by far, and not one that you would want to be bitten by. (As a general rule, avoid being bitten by anything with "alligator" in its name, or "snapping".) They were once extremely common, but people ate too many of them, and now they are protected in every state in which they occur. 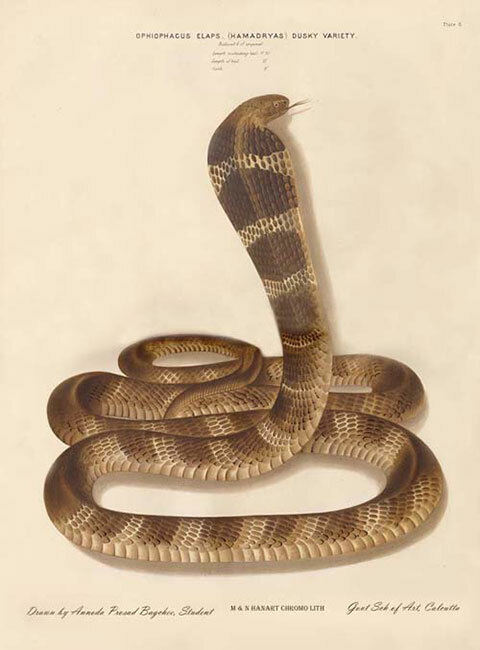 Illustration from Holbrook's North American Herpetology, 1842 in the public domain.